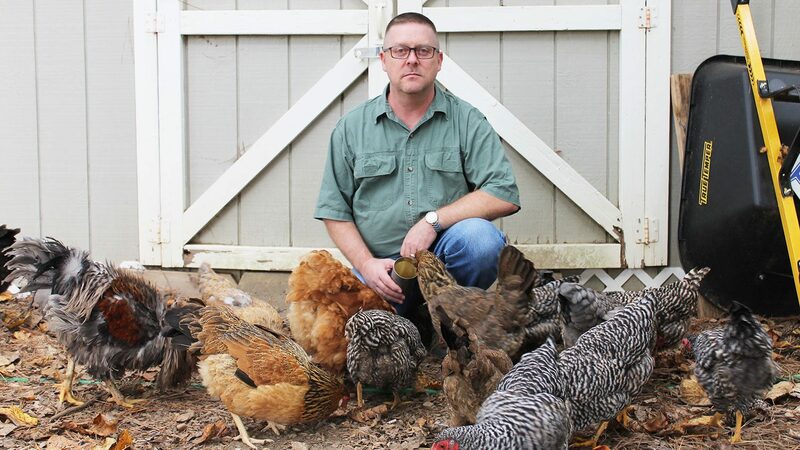 NC Farm School graduate James Payne of Franklin County tends chickens now and plans to add pasture-raised pigs with guidance from NC Farm School. James Payne has had two successful and rewarding careers, and now, with the help of NC Farm School, he’s put together a solid business plan that will allow him to launch a third one. This time, he wants to be a farmer. Payne, who lives in Franklin County, is one of 342 graduates of NC Farm School, a partnership of NC State University’s Department of Agricultural and Resource Economics and NC State Extension. Started in 2012, the program is designed to help increase the number of sustainable and economically viable farms in North Carolina. To make the program accessible to people in all parts of the state, the Farm Schools are moved around to different locations from year to year. For 2018, schools will be offered in Greenville and Lincolnton. The eight-session program guides aspiring farmers through the process of writing a sound business plan, says Derek Washburn, an Extension associate who helps coordinate the program. They also get to tour working farms where experienced farmers share their expertise and their advice. Farm School forced me to build a real business plan, not just throwing a bunch of money into farming and hoping it sticks. Farm School participants have come from all walks of life. They include young people just getting started in their careers, mid-career folks looking to make a career change, and others who, like Payne, are looking for something to do once they retire. Participants come with wide-ranging ideas. About half of the graduates are actively farming now in an array of endeavors – from producing small fruit to tending water buffalo for meat and cheese. Anyone can apply for farm school, but access to land is important. “Land can be a big barrier for people who are serious about a starting a farm business, so that’s why we have designed the program for people who can find land to start a farm,” Washburn said. Payne has 13 acres – mostly woodland — surrounding his home in Zebulon. He wanted to find a way to use the land to earn a little bit of money. He’d grown up in Waynesville around tobacco farming, working on his father’s and uncles’ farms. Just about everything – from setting the plants in the field to harvesting the leaves in the late summer — was done by hand, Payne says. And he hated it. So, when he was 17, Payne signed up with the National Guard. Over his 20 years of service, he was frequently deployed after natural disasters in North Carolina and other states. He also served during wartime in Iraq and Afghanistan. Now, he has a civilian job as an area emergency manager with the U.S. Veterans Administration. Several years ago, he tried a suburban life, but he found that he was “a country boy – a hillbilly, and proud to be called that.” He began to look more favorably on the idea of farming because it would give him the opportunity to be out-of-doors and to work for himself, at his own pace. He thought he’d like to raise meat goats, and he looked for resources that could help him get started. He found information about NC Farm School on Extension’s website, and he applied and was accepted. The course completely transformed his ideas. “As I worked through the business plan, I did the pencil test and found that I didn’t have enough acreage to do meat goats and be profitable at it. In fact, I discovered very quickly I was just going to lose money hand over fist if I did meat goats. “I thought, ‘Gosh, what other enterprise can I do?’” he says. “And then I did the figures on pasture-raised pork and found that I could actually make money — not just breakeven but actually make money. “Farm School forced me to build a real business plan, not just going and throwing a bunch of money into farming and hoping it sticks. Now I know how to go about looking for buyers and how to market and I’ve put all that together,” he says. Right now, Payne tends a small backyard poultry flock, and he’s planning to go slowly in building his farm. “I want to start out slow and not go into debt to do it. I plan to do everything by myself,” he said. Asked what he’d say to people who are considering Farm School, Payne said, “Definitely do it. I would give it my highest endorsement to someone who is thinking about farming, like me, or who’s getting started now.” It would also be appropriate, he says, for experienced farmers who struggle with the business side of their operations. “It’s a great path for anybody who wants to be their own boss, if they are self-directed and self-motivated,” he says. The application period for two 2018 NC Farm Schools is now open. Invitations to join the program and make payment ($399 for individuals or $599 for a two-person team) will be made in January. More information and applications are available online at ncfarmschool.ces.ncsu.edu/ or by contacting Derek Washburn at (919) 515-4614.